The episode was written by Anthony Terpiloff, an American-born playwright and tv scriptwriter, who was living and working in Britain. Terpiloff had worked on both sides of the Atlantic, his resumé including early episodes of The Avengers as well as scripts for Ironside and The Alfred Hitchcock Hour - which ought at least to have satisfied the demands of the show's US backers - but at that time, his most acclaimed work was a tv play called Poet Game which had been produced by the BBC in 1972 with Anthony Hopkins starring (and coincidentally Barry Morse in a supporting role). However, he'd probably come to the attention of the Andersons after writing an episode of The Protectors. Terpiloff was a real find for Space: 1999. Certainly the lead writers thought so, as they would ask him to contribute a further three scripts to the first series - two of them written in collaboration with his wife Elizabeth Barrows - and they are, I think, amongst the most show's finest and most literate episodes. The major effects sequences feature the Kaldorian ship. Shaped rather like a strange blue egg, its erratic style of flight - tipping and swaying and looping around as its descent engines fire - create some unusual images, which contrast nicely with the smooth movements of the Eagles. (There are some lovely shots of the Eagle flying low over the lunar surface on its way to recover the alien vessel.) The rescue pods carried by the Eagles here are marked by their alternating red and white stripes - presumably designed to suggest some hint of the red cross symbol (and thereby marking these as space ambulances). The interior of the Kaldorian ship gives Keith Wilson the opportunity to design something stunning and alien. [One of the highlights of the series is the juxtaposition between the sleek, clinical lines of the Moonbase and the strange alien environments the Alphans encounter.] Everything seems to be made of clear or translucent materials: the perspex caskets containing the crew; instruments or machinery made up of many-coloured crystal rods mounted on light-box pillars. The full extent of the chamber is curiously undefined, swags of some diaphonous material hanging from the central point of the roof, and serving to obscure the walls. This effect extends the egg metaphor of the ship's exterior, by suggesting amniotic fluids surrounding the occupants. Wilson also designed the look of the aliens themselves (as indeed he does throughout the first series - aside from Gernreich's work on the Moonbase uniforms, there is no separate costume designer; it allows Wilson to be production designer in the fullest sense of the term, able to create a cohesive visual statement). The Kaldorians are all well over six feet in height (even the women); with their long hair and flowing multi-coloured robes, not to mention their zen-like attitude, some commentators have labelled them "space hippies", which is somewhat simplistic. [And if you've ever seen the Star Trek episode The Way to Eden you'll know how badly that concept can be handled.] Wilson designed special make-up appliances to alter the shape of the Kaldorians' noses. [As a way to make an actor look alien, this has become a cliché in sci-fi shows.] They all have the same white and black markings on their nose and brow, though its not clear whether this is an actual skin pigmentation, or some sort of tribal face paint or tattoo. Koenig's party are accompanied to the spaceship by two security guards: the black one is named Quinton (his name being displayed on his space helmet); the other, whose face is not clearly seen behind his visor, is addressed at one point as Tony. Some fans have tried to suggest this is an early appearance by Tony Verdeschi, but actually these two are characters who turn up throughout the first series - Tony's face is clearly seen in other episodes, and he doesn't look anything like Tony Anholt. (He and Quinton are the two guards Victor orders out to retrieve Nordstrom from the nuclear disposal area in the Breakway teaser, for instance.) The use of recurring background artists adds a certain verisimilitude to the series - in addition to these oft-seen guards, many of the Main Mission and Medical Centre staff recur throughout - selling the idea that the base is manned by a real group of people. This was the first episode not to have its own musical score composed. It was standard practice on most ITC shows not to have a full score for every episode - instead, the composer would write cues for maybe half the episodes, which - although they matched the specific action onscreen - would also form a library of tracks that could be cut into the remaining episodes as appropriate by a skilled music editor. In the case of Space: 1999, the budget for original music only permitted Barry Gray to compose full scores for four episodes - the bare minimum allowed by the stringent rules of the Musicians' Union. I swear that if you didn't know, you couldn't tell: though each episode Gray scored has its own musical identity, with defined and specific themes, their re-use in various combinations across the episodes demonstrates how easily they form a greater musical texture for the series as a whole. [Try playing the soundtrack CD in shuffle mode, and you'll see what I mean.] Music editor Alan Willis makes a significant creative contribution to the show. For Earthbound, the soundtrack is carefully assembled from sections of Gray's first three scores. Later episodes will be more inventive, dipping into Gray's back catalogue (particularly selections from Joe 90 and The Secret Service - it's odd that Anderson's most whimsical shows should produce some of Gray's most moody and evocative cues); as well as a large selection of tracks from commercial music libraries. One thing that strikes me though - how easy it is for Simmonds to gain access to this most secure area, simply by appropriating Koenig's commlock. (He also acquires a laser gun from somewhere, so he probably used the command commlock to gain access to the armoury.) I realize it's analogous to stealing someone's key and using it to burgle their house - but in the real world we have fingerprint recognition technology, which would have rendered the commlock useless in Simmond's hands. At an even more basic level, requiring the user to enter a PIN into the commlock would have added an extra level of security. So everyone's commlock is specifically programmed with their own level of access. Kano seems to be the officer responsible for this (or at least he arranges for the commlocks to be programmed by the Computer). When requesting a replacement for his stolen command commlock, Koenig tells him to: "Explain to the Computer as best you can." Now in most circumstances, this might seem like just a throwaway quip - if it weren't for the somewhat capricious behaviour the Computer displays in this episode. When asked to make an objective selection of the one person from Alpha to return to Earth, it initially comes back with a list of three choices - as with the "human decision required" following the breakway, the Computer once again tries to put the ball back in Koenig's court. The ability to reinterpret its instructions (to pass the buck as Koenig says) would seem to place the Computer well outside the parameters of a simple programmable calculating machine - it's not quite a Turing Test, but it's a big step towards artificial intelligence. When Simmonds calls for help, Koenig realizes grimly that there's nothing they can do for him. It's unclear exactly long how the Kaldorian ship has been gone at this point, or how far it's travelled. (The Kaldorian ship launched around 0930 Lunar Time, and Simmonds's commlock reads 1148, but of course we don't know if it's the same day when he wakes up, although that's certainly the implication; since no one replies to his message, we can't say if there's any significant time lag in the radio signals being received. Nor can we really say how fast the spaceship travels - it's worth noting that it will take 75 years to cover a distance the Moon has managed in just a few weeks.) What is certain though is that there's an effective range beyond which the Eagles cannot fly and still hope to return to the base. This is going to be limited by factors such as the fuel capacity of an Eagle, not to mention the increasing distance back to a constantly moving Moon (which will impose strict time limits on the surveying of new planets in future episodes). Since, prior to the breakaway, the Eagles made regular trips to and from Earth, we can infer that they must be at least capable of a round trip of 252,088 miles (the distance of the Moon at apogee). So the Kaldorian ship must already be beyond this limit. This is a series that takes great pains to present aliens as... well, alien - strange, remote, unknowable (sometimes even unseen) and often impossible to communicate with. The Kaldorians however are fairly close to humanity. Helena assesses that they are medically compatible with Earth people, which implies that their basic life processes - heart, lungs, digestion, perhaps even reproduction - are essentially the same as ours. (And indeed, Zantor does display a hint of attraction towards Helena, suggesting that their emotional and romantic impulses may be much the same also.) 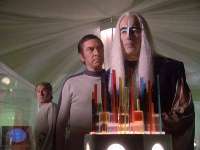 The Kaldorians are played with a sense of calm, gravitas and quiet dignity - but then with Christopher Lee playing their leader, you wouldn't expect anything else. [They may have the standard sci-fi funny noses, but they avoid the sort of exaggerated ethnic or cultural stereotypes usually deployed to represent alien races in sci-fi shows.] They are accepting, forgiving and seemingly devoid of hostility. Even when one of their number is accidentally killed by the Alphans investigating the spaceship, they show no anger or aggression. Instead, Zantor invites Koenig's party to join with them in a remembrance ritual. Gathering around the remains of their colleague, they raise their arms to their chests. It's like they're gathering the soul of the fallen into their hearts: a solemn and touching moment, heightened by the Alphans' awkward yet sincere attempts to join in the ritual. When the Kaldorians left their planet, some 350 years earlier, it was already dying. We don't know whether some catastrophe befell them or if the processes of life came to a natural ending - but Zantor tells the Alphans that all forms of life on Kaldor ultimately became sterile. It's easy to miss this implication, since he's talking about the fate of the symbolic libra bird at the time, but he quite clearly says that everything living on Kaldor became sterile. This presumably includes the Kaldorians themselves. This revelation makes sense of so much of their behaviour and attitude: they're the last survivors of a dying race, sterile and therefore unable to reproduce. They must know they're the last generation of their people - a species on the verge of extinction. So perhaps we can see them as akin to someone living with a terminal illness - there is a very finite existence ahead, and they face this future with stoicism and dignity, going gentle into that good night. (So that's why they don't seek revenge for the accidental killing of their colleague - there's little point making a fuss over someone who was doomed to die soon anyway - they merely accept the end when and however it comes. When Koenig asks what they'll do if they find they're not welcome on Earth, Zantor says: "We would submit ourselves to voluntary reduction. In your terms, we would take our own lives." Again, it's simply a case of the inevitable coming just a little sooner.) They've also learnt to put aside selfish and individual desires. The Kaldorians act as a group - perhaps they even have a group consciousness of sorts, their minds and spirits having become entwined and interdependent. Zantor is the only one who speaks, but clearly he speaks for all. (The concept of the shared mind or intelligence - encompassing a planet or a civilization, or maybe permeating the entire universe - is one that the series comes back to a lot, so it's not such a leap to postulate it existing here as well. It may well derive from the writings of Olaf Stapledon, particularly the novel Star Maker, which seems to prefigure a lot of the ideas explored in Space: 1999.) When faced with an extreme example of selfishness and individualistic determination - Simmonds's holding the base to ransom to get aboard the spaceship - Zantor can only rationalize it by the conclusion that "the Commissioner is diseased". With the Kaldorians expecting to die, the effort to send out spaceships to each world they believe can support their lifeform would seem to be an attempt to find places where they can spend their final days. Maybe they want to meet and interact with other species while they still can, to pass on the accumulated history, heritage and wisdom of their culture, to leave its imprint spread out across the inhabited worlds of the universe - so that once they're gone, something of their existence and their civilization will still remain for posterity. It's a noble ambition. There's a wonderful moment when Zantor expresses surprise at the limitations of the Moonbase Computer: "We overestimated your computer's ability to analyze the human spirit - it does not seem to have understood it." The implication is that the Kaldorian culture has totally integrated scientific and technological development with spiritual and philosophical thinking. (As Zantor says, their own computer has no such difficulty in understanding.) In this combination of mind and soul, the Kaldorians could be seen to embody the very ethos of Space: 1999 - how appropriate then that they're the first aliens we meet. This episode really exists for the purpose of writing out Commissioner Simmonds. As I noted before, Breakaway seems to just stop, leaving the mystery of Meta hanging, never to be followed up; likewise, the antagonism between Koenig and Simmonds is never properly resolved. The Commissioner's presence on Moonbase Alpha would obviously continue to be a major source of character conflict - except it would seem, the writers didn't want to explore that particular avenue, and hadn't included the Simmonds character in the series format. So having left him alive at the end of Breakaway, they were stuck with a character that they hadn't made provision for. Simmonds is the fourth lead effectively, a more important presence in the first episode than Morrow, Carter or any of the other supporting characters. After Breakaway, you'd expect him to continue in the series, throwing his weight around and interfering in all Koenig's decisions. Clearly though, they've no intention of following up this particular story strand. The next three scripts have gone into production without even a mention of Simmonds. [Wouldn't it have been so much easier if they'd killed the character off during the breakaway? In the series novelization, that's what happens - I suspect because the author couldn't comprehend how Simmonds could be absent from the events of the subsequent stories, and felt it was easier to get rid of him.] So there's only one thing for it - Simmonds must be got rid of. Now, given the usual attitude to continuity in an ITC show, the producers here show some respect for the viewer by bothering to tell us what happened to this character rather than just trying to quietly forget about him. This episode was being produced while the Watergate scandal was rumbling on in America, a time when people were starting to see their political leaders as having feet of clay. Though Simmonds is certainly viewed with that degree of cynicism, in many ways the depiction goes further - it seems to prefigure the way politicians would really become by the year 1999: the era of political "sleaze". The public would come to perceive many politicians as corrupt and self-serving, keen to exercise power but not to take the responsibility that goes with it. Whereas in earlier times, politicians would resign from office once tainted by scandal, by the end of the 1990s they would be more likely to try to hang onto their position, to ride out the political storm, to offer excuses and contrived explanations, to blame errors on subordinates rather than accept that the buck stopped with them. Simmonds behaves like that here - proclaiming his authority in the same breath as he shunts responsibility for the Kaldorian's death onto Koenig, the "operational commander". 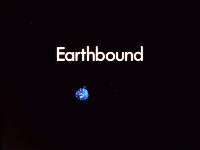 Earthbound is an examination of the conflict between the self and the community. The Alphans are shown two extremes here: the Kaldorians who exist as a group without divisive individual desires; and Simmonds who endangers the whole of Alpha to get what he wants. [He embodies the self-obsessed "me" culture that came to dominate the Thatcherite era of the 1980s - when the Prime Minister infamously said: "There is no such thing as society."] Koenig has already made his choice: he stands for the community. The Alphans have accepted his leadership. In their desperate struggle to survive, dissenting voices would spell disaster; so the Alphans must function as a group, which means accepting the autocratic rule of a single leader. Koenig's command could be seen as paternalist, even as a benevolent dictatorship. He invites discussion of issues, but eventually makes his own final decision. Moonbase Alpha is not - cannot be - a democracy. Koenig is aware of the weight of responsibility he bears - and in return he's dedicated himself to the Alphans' continued welfare. (So much so, he won't let his name be considered in the Computer's selection of someone to return to Earth, something he knows Simmonds could never understand). It's pretty clear Simmonds has not endeared himself to anyone on Alpha. All the senior staff seem to regard him with nothing short of contempt, resenting his interruptions, his impatience - and also, I suspect, his opposition to Koenig's decisions. This comes to a head as Simmonds holds the base to ransom - Morrow clearly speaks for many when he's says they'd be better off without the Commissioner. By his arrogance and disruptive behaviour, Simmonds has excluded himself from the community. Another thing Simmonds doesn't stop to consider: whether in fact the Earth - or life upon it - still exists. Koenig raises this possibility as a word of caution to the Alphans dreaming of returning to Earth. It's an idea that comes somewhat out of the blue - there's been no previous discussion of it in the series. And certainly the Earth was still there when the Alphans picked up those last tv signals in Breakaway - but the last thing they heard was news of the terrible destruction wrought by the gravitational forces unleashed. That could be only the beginning. The loss of the Moon would lead to the Earth's ocean tides being completely disrupted - which might in turn lead to uncontrollable flooding. Other effects caused by the breakaway could see the Earth's axial tilt altered, changing the seasonal variations. The speed of daily rotation might be greatly increased, which would have adverse effects on the planet's weather system: with the possible results of massive raging storms and continual high winds. So there's a very real possibility that the Earth would cease to be a suitable environment for supporting life.